Do you live in a boisterous neighbourhood? Do you know what to do in order to minimize, if not get rid of the noise generated by a loud neighbour? Ever grown tired of listening to next door television sound, music and conversations? The answer would be to soundproof your walls in your own home to boost the level of privacy between rooms. There are a number of soundproofing products that you can use to effectively block the noise coming from beyond your walls. Whether you just want some peace and quiet, or you have plans to soundproof your audio-visual and game room, or you are about to build a recording studio, you have to make sure that your walls are properly sound insulated. Soundproofing methods are designed to diminish sound transferring from one room to another going through separating walls. If you can hear your neighbours as they go about their daily business, that can be a source of nuisance. All of us have different levels of noise sensitivity, and if you can hear the TV or conversation through your walls, you can apply some simple solutions to minimize the noise level. A basic wall soundproofing idea would be is to increase the mass of your walls and by doing this, you would be able to block a considerable amount of sound from passing between the separating walls using thick or heavy materials and applying them directly onto the wall. 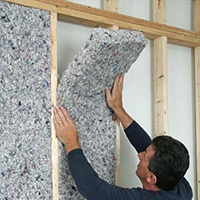 You can soundproof your wall by adding mass to the wall using specialist thin wall soundproofing panels. These panels can increase the sound insulation of any type of wall, blocking TV sound and other household noises that should not be normally heard on the other side of the wall. There are also other equally effective soundproofing materials available on the market today and that includes the Green Glue Foam Sealant. In fact, they have become all the rage when it comes to hassle-free soundproofing. Most have been packaged in the familiar dispensing tubes, making them very easy to apply onto holes and gaps. Green Glue sealants are water-based sealants designed to minimize the amount of sound passing through walls and partitions. Its main function is to attain and sustain the specific STC standard of the system design. The sealant retains its flexibility and sticks to both wood and metal studs, gypsum boards, concrete, and all other types of structural substrates. Green Glue sealants can maintain a tough rubber-like cap that works even against sound, air entry and moisture. They are easy to apply and clean-up is also quick and easy. All you need is just soap and water. Today, a lot of drywall installers and even architects have recognized the efficacy of Green Glue sealants in reducing sound transmission. It is now commonly being used as a sound-reducing material in the construction of soundproof walls. When smeared between layers of drywall, it has the capacity of actually dissipating sound vibrations that go through floors and walls.